Elmer’s Glue Locker ransomware uses sophisticated techniques to infiltrate computers and hide from its victims. Use Reimage to determine whether your system is infected and prevent the loss of your files. Elmer’s Glue Locker v1.0 is the name of a virus which fails to become a real file-encrypting threat. Thanks to Karsten Hahn, the malware has bee detected roaming on the cyber space. The name of the virus does not leave the impression of a highly exquisite malware. Since the Elmer‘s Glue brand name glues are sold in the US supermarkets and especially North Carolina, it is likely that the penetrators reside in that location. Furthermore, the virus demands 16 bitcoins (≈$36 000 000) in exchange for the supposedly encrypted files. The good news is that the virus does not encode files, but functions as scareware instead. The screen locker may be canceled simply by pressing ALT+F4 key combination. Further instructions how to remove Elmer’s Glue Locker v1.0 are provided in the final section of the article. In order to accelerate the process, you may employ Reimage or Plumbytes Anti-MalwareMalwarebytes Malwarebytes. This weekend seems to have been rich with screen lock viruses: SmartRansom, Roblox ransomware, Globe Imposter, etc. It seems that the outbreak of notorious WannaCry virus has encouraged even felons with little programming knowledge to bombard the virtual community with this type of viruses. 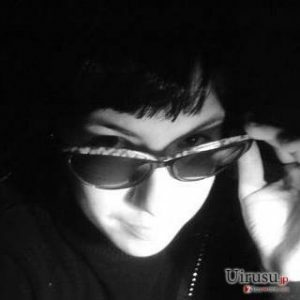 Elaborating on Elmer’s Glue Locker malware case, the perpetrators seem to be highly ambitious as they require a ridiculously big amount of money from their victims. Nonetheless, they failed to develop a full-fledged malware as users cancel the ransom window by clicking the above-mentioned combination of keys. The entire malware seems to be a joke rather than a real virus. Even though the ransom notification instructs users to download Tor browser and then access the specified address, create a Bitcoin account, there is no need to comply with the demands. Instead, focus on Elmer’s Glue Locker removal. Screen lockers also tend to be distributed the same channels as file-encrypting threats. Considering the low-level complexity of this malware, it’s executable file is likely to be distributed disguised in a fake application or browser extension. Such screen locker malware also tends to be placed in gaming or torrent sharing domains. Recent news reveals that netizens risk getting infected with the ransomware by downloading corrupted movie subtitles. Arming up with cyber security applications is not enough to face ransomware. Besides combining your anti-virus software with malware elimination tool, restrain from visiting questionable domains and enabling new programs without examining them thoroughly. 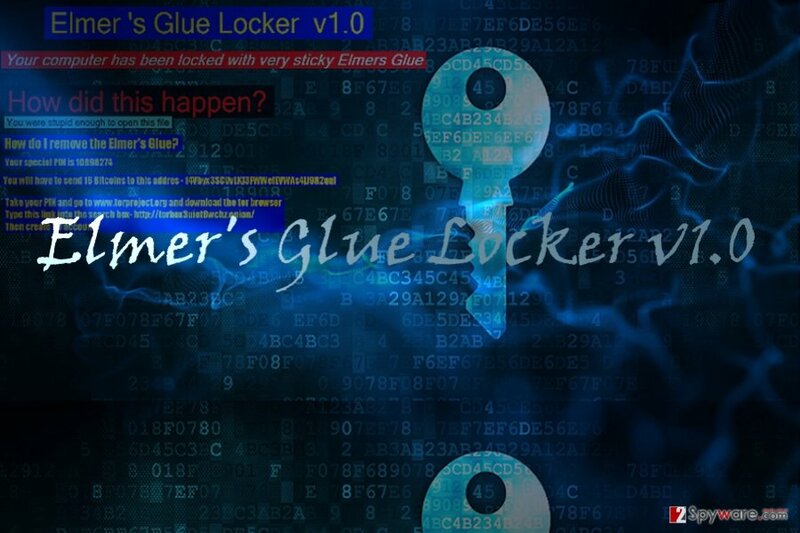 The title of Elmer's Glue Locker virus implies that the fraudsters may launch the second version in the future. Click the above-mentioned set of keys to exit the lock screen. You may also try terminating its executable file in Task Manager. Click ESC+SHIFT+CTRL and launch Task Manager. Find ElmersGlue.exe file, right-click on it, and choose “End Task.” This will enable you to recover control of the device. Then launch an anti-malware app and remove Elmer’s Glue Locker v1.0 virus permanently. Automatic elimination also functions as a more convenient option as malware elimination tool locates all possible corrupted files and eradicates them permanently. This option also provides more guarantees in case Elmer’s Glue Locker v2.0 version comes in the future. Lastly, check instructions below if you cannot proceed with Elmer’s Glue Locker removal. In case ALT+F4 combination does not cancel the window of Elmer’s Glue Locker, reboot the computer in Safe Mode and launch a virus fighting utility. Log in to your infected account and start the browser. Download Reimage or other legitimate anti-spyware program. Update it before a full system scan and remove malicious files that belong to your ransomware and complete Elmer’s Glue Locker removal. When a new window shows up, click Next and select your restore point that is prior the infiltration of Elmer’s Glue Locker. After doing that, click Next. Once you restore your system to a previous date, download and scan your computer with Reimage and make sure that Elmer’s Glue Locker removal is performed successfully. Guide which is presented above is supposed to help you remove Elmer’s Glue Locker from your computer. To recover your encrypted files, we recommend using a detailed guide prepared by 2-spyware.com security experts. Will Data Recovery Pro is useful in recovering files? It is always recommended to backup your files and secure these copies. If you haven’t made them, this tool serves as one of the options to restore damaged or lost files. The program might be the last straw for users who have been struck with a full-fledged virus. The program employs shadow volume copies to restore files. In most cases, this method is effective unless a file-encrypting threat deletes these copies beforehand. ^ Karsten Hahn. #ElmersGlue #screenlocker at 1/60. Twitter. Online source for news and sharing experiences. ^ Olivia Morelli . Hackers endanger movie lovers by embedding malware into subtitle files. 2-spyware. Remove adware, spyware. This entry was posted on 2017-05-29 at 05:57 and is filed under Ransomware, Viruses. You can quickly scan the QR code with your mobile device and have Elmer’s Glue Locker ransomware virus manual removal instructions right in your pocket. How did you remove Elmer’s Glue Locker virus?